#Ab Hoga NYAY slogan it is the most famous and popular slogan that is heard after every one hour of intervals, describing the revival of the congress party that will returning back bringing judgement and progress to the country. 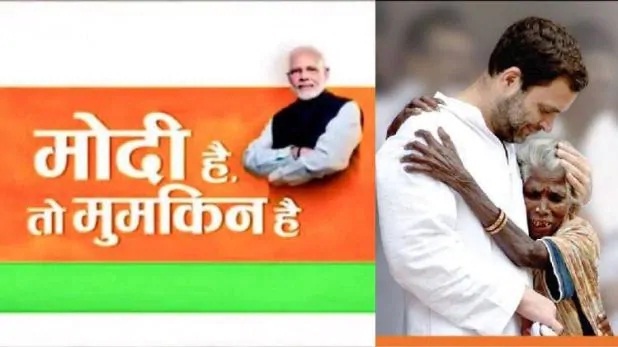 “Main hi toh Hindustan hun” well versed music involved with a stronger campaigning of the Scheme NYAY by the congress party that will be initiated immediately after the Party comes to rule. Campaigning by the Congress Party is on a stronger mode and musically approaching the people of India. Hardly #Phir Ek Baar Hum could be heard and found to be less popular. Campaigns treasury and spends from Congress Party are more impulsive compared to Bharatiya Janata party.